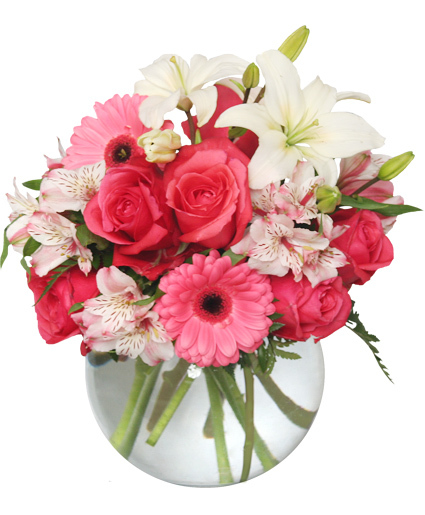 This large clear vase is filled with pink snapdragons, fragrant white lilies, large pink gerbera daisies and pastel roses. 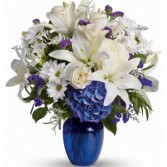 Complete with mixed greenery and filler flowers. Perfect for any spring occasion. 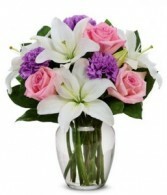 A clear ginger jar vase filled with fragrant white lilies, soft pink roses, purple carnations and mixed greenery. 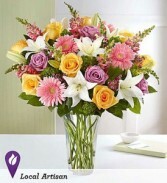 Just right for any Spring table.